1a. Leaves pinnately incised, rather herbaceous, densely covered with partially very long hairs. 6-12 pseudoumbels per inflorescence. Simple root system without any thickenings. 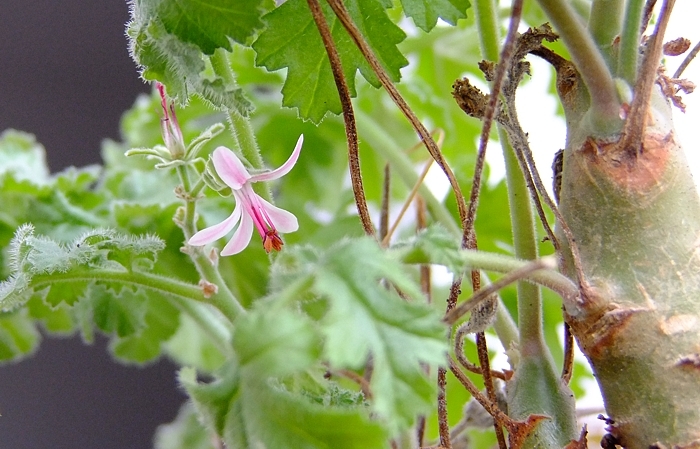 Pelargonium carnosum ssp. carnosum (L.) L'Hér. Hortus Kewensis 2 (1789) 421. 1b. Leaves bipinnately divided, slightly succulent and covered with microsopical papillae. 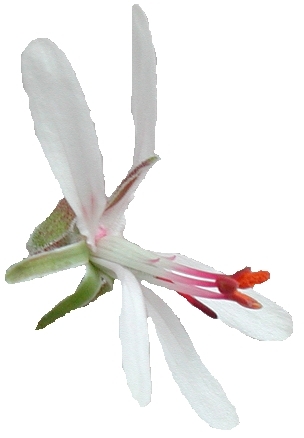 Up to 50 pseudoumbels per inflorescence. Lateral roots form series of small tubers. 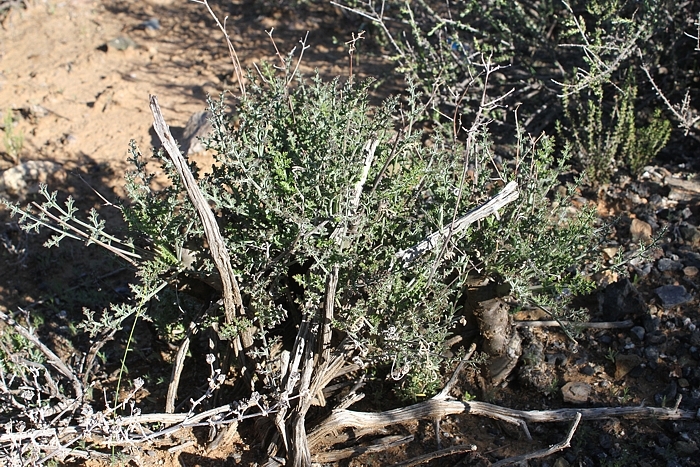 Succulent, branched shrub up to 70 cm (ssp. carnosum) or 20 cm (ssp. ferulaceum). 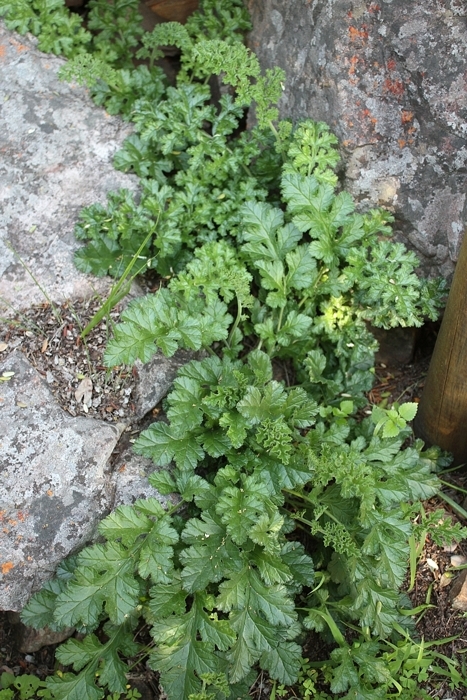 Stems thickened, up to 30 mm (ssp. carnosum) or 50 mm (ssp. ferulaceum). Bark green to brown, smooth. Branches are generally smooth, only sparsly hairy when young, usually with persistent remains of petioles. Incised to pinnately divided, very variable, chanelled along the midrib, 3-25 cm long and 2-7 cm broad. 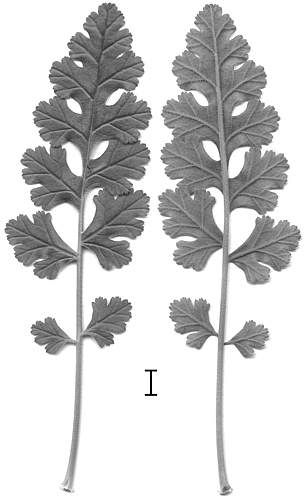 Petioles 1-10 cm. Stipules membraneous, small. Branched inflorescence with pseudumbels of 4-6 flowers. Pedicel 3-5 mm. P. carnosum ssp. ferulaceum inflorescence. 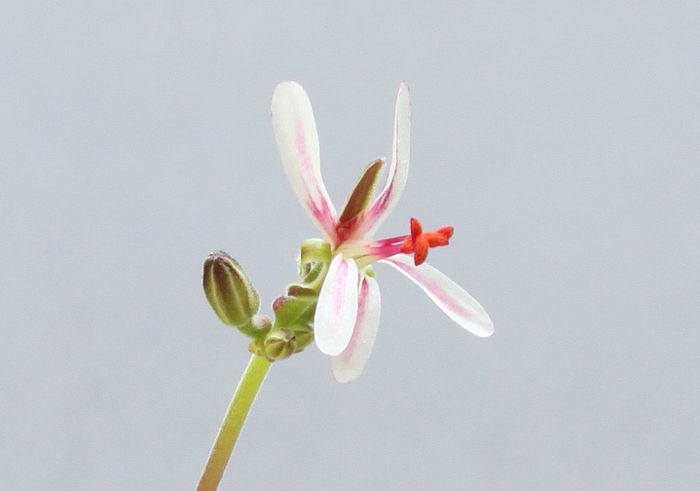 A flower of P. carnosum ssp. 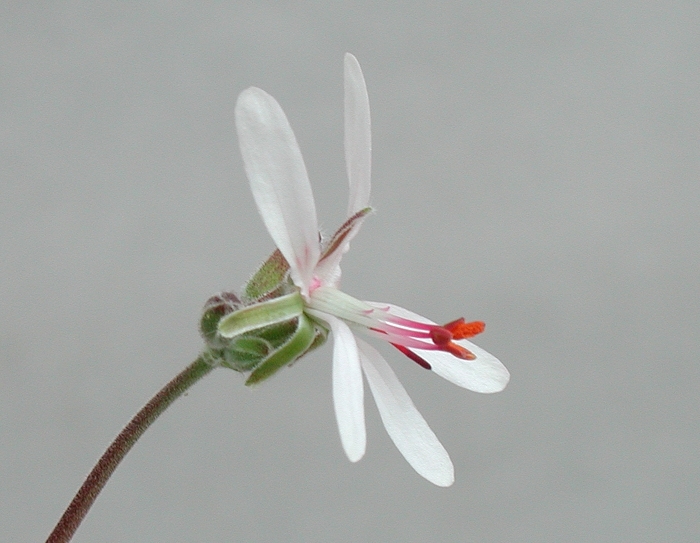 ferulaceum A&B4435 from close to Worcester, with the unusual pink stripes on all five petals. 5, lanceolate, recurved. Hypanthium 8-9 mm. White to pink, posterior cca. 7x(3-4) mm, slightly reflexed, with markings or stripes, anterior smaller. 5 fertile, equal in legth. Triangles: P. carnosum ssp. carnosum, circles: P. carnosum ssp. ferulaceum. In the geographic region between the two distributions, intermediate forms and hybrids exist, also with other taxa from the Otidia section. P. carnosum ssp. ferulaceum in the common of the picturesque town of Matjiesfontein. Other otidias are usually found around here, P. alternans, P. crithmifolium and a little north of this area, the new P. pachypodium. 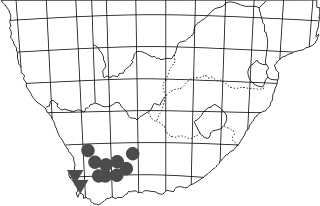 P. carnosum occupies extremely varied ecological niches, from the arid Karoo to rain-drenched hill slopes just north of Cape Town, where a form of P. carnosum ssp. carnosum with thin stems and small leaves keeps company to P. tenellum (for a photo see there). burmannianum (Eckl. & Zeyh.) Steud. Becker M., Albers F. (2009). This site and all subpages were created and are maintained by Matija Strlic. All photos ©Matija Strlic unless otherwise indicated, 2000-2018.